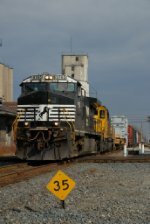 Description: Q687 w/NS power meets Q124 w/traditional CSX power. CSX owns this trackage. Description: Northbound empty graining holding at North Midway on the BNSF Fort Worth Sub. You had to be there to take in the beauty of the engines and the stench coming from the trash bins just to the west of this train. Description: Whiteface loco highballing a westbound manifest through Pine Junction. Description: Curious power leads a CSX train south through Deshler making every bit of the displayed speed sign. Description: Another person runs through the flashing red lights on 42nd St. Description: NS 39G passes NJT's 36th Street light rail station as it makes its way out of Pavonia Yard. And yes, that is the moon in the far right corner. Description: Sitting in the Lounge car on the westbound Capital Limited we hit some congestion near Waterloo. Description: NS #055 drags yet another load of "Cats" southward towards FL. These loads will be put onto 321 at Macon for the remainder of the trip to Jacksonville.